So we managed to whip up a tidal wave of emotion and opinion when we made the call that the "outsourcing industry", in its current state is, quite frankly, a sham. When over 30,000 people read something, there's a reason why... so let's drill down into what this all means. 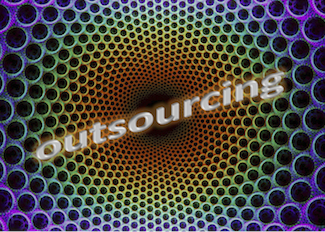 Outsourcing has an image problem, not a delivery problem. The intent of the blog was to deplore the shoddy image of outsourcing in today's economy and the discuss the lousy job the industry - as a whole - has done in defining itself. It wasn't to slam the premise behind outsourcing, or the performance of engagements: the "industry" produces wads of cash and healthy margins while saving buyers lots and lots of money (our own research emphatically supports this fact). Buyers and providers are desperate to alter the perception of "outsourcing", it's the intermediary businesses profiting from vendor marketing dollars which are afraid of change. I have never had so many “Thank God you called it” emails from buyers and providers this week. The only people we have upset are some of the events firms and advisors/analysts who take money from service provider marketing people, as this paints their whole modus operandi in a bad light. I even got some hate mail from a couple of entities, whose entire businesses survive on extracting marketing dollars from services providers, because they claim they would lose their identity if we stopped lauding the "outsourcing" vernacular. They are worried that if outsourcing gets submerged into the business "mainstream", service providers will park their marketing dollars with entities who are marketing/promoting/analyzing real business services and not only "outsourcing". While many intermediaries constantly complain that buyers wary of outsourcing are afraid of change, why don't they practice what they preach and change their own philosophy - and then their clients will follow? Buyer networks need to be focused on the business end-game of outsourcing, not the "act" itself. “Outsourcing” as we call it today, really is a component of a business function, not the business function itself. It is a means to an end, not the end itself. It’s not dissimilar from the Cloud computing concept, except it’s about externalizing services, not IT infrastructure. Regardless of business function, Cloud has relevance as an enabler to achieve better things – and it’s the same for “outsourcing”. I would prefer to see us creating broader communities around business objectives and have process-externalization and expertise augmentation as a key part of each discussion. For example, you can’t go to a conference focused on creating better global finance operations, without discussing shared services and offshoring / BPO. However, the core focus of that network is about achieving more productive, relevant and global finance, where senior people can have rational and objective-led discussions on global operating models that can take better advantage of global talent and technology. 1) The Labor Arbitrage Industry. Let’s face some home-truths here – much of “outsourcing” as it exists today really is labor arbitrage for most of the lower value work in IT, F&A, Procurement, CRM etc. The common thread among buyers is more how to manage LABOR ARBRITRAGE effectively, than anything else. So why doesn’t that industry simply call itself the “labor arbitrage industry” and focus itself on how to improve processes once part (or all) of them have been moved offshore – essentially, “we’ve done our lift and shift, now let’s see how we can make it better, as opposed to running the same cr*p for less”. For some buyers today, all they really care about (sadly) is labor arbitrage and making a few adjustments here and there to make the experience more bearable for themselves. Hence, if achieving little more than operational efficiency and low-cost delivery is all they care really about, then let's have them flourish in their very own industry focused on this very practice. A spade is a spade, so let's stop bullsh*tting around the bush here. 2) The Business Services Industry. Conversely, when we get into the new generation of expertise augmentation engagements, the focus is on a broader range of processes where – in many cases – labor arbitrage isn’t really possible. For example, with pharmacovigilance, the chances are that “buyers” need added help with compliance and quality measures that they simply do not have, and there really aren’t any staff that can be laid off to offset the cost of the incremental services. Moreover, with even more commonly-used horizontal processes such as procurement and HR, most “buyers” don’t have excess fat to burn – they have already trimmed their inhouse teams to the bone (i.e. many firms have one HR rep to as many as 200 staff). They need new services and help, not a replacement of inhouse labor. So... for those of us who care about achieving new value and new productivity and feel we have a pretty strong handle on labor arbitrage these days, let's focus on Business Services and the process acumen, domain expertise, technology and global delivery required to make this all happen. The key is to bring the global services discussion to the real business table, and not create some oddball assortment of offshoring experts who are alienating themselves by creating their own little siloed network.The more the “outsourcing” industry (as we have been calling it) remains in its silo, the harder it’s ever going to be to have the global business model discussion with the real business function leaders. We have to move the needle on this issue, or we’re going to become part of a dying breed. However, we need to start setting the new agenda on how business function leaders approach expertise augmentation. They’re the people we have to be talking to. Join us in our cause! Too many people scan headlines and don't absorb the real facts - you know who you are. Yes, we sensationalized the headline to get the eyeballs this critical issue warrants. However, if you actually read the bloody piece, you'd realize we were not debating the pros and cons of outsourcing itself, we were highlighting what the industry needs to do to become more relevant to the real business decision makers (i.e. less wedding-dress and more marriage). Phil - this is a very good clarification of the discussion. I couldn't agree more with segmenting the arbitrage-interests from the value-service interests. From my experience, it's all about common interests and maturity. Some buyers will only ever care about meeting cost targets and SLAs. They just want advice on how to manage and enforce contracts effectively. More experienced and sophisticated buyers want to talk about effective governance frameworks, more collaborative models etc. It doesn't make sense to put both these camps together, as we'll never progress from where we are today with these broken networks. Keep the great blogs coming - you are doing the industry a great service getting these discussions to the table! I really like the term ‘expertise augmentation’ and agree with main themes of this post – ruffling a few feathers here and there is a good way to kick off the PR effort around this. As an outsourcer whose operating approach has expertise at the heart of our model, I agree with your proposition however the challenge for everyone who has a BPO model that revolves around human capital, knowledge or expertise is convincing senior management that they should focus on what they are good at (their core business) and work with specialists (not generalists or multi-towered providers who offer surface level insight) to do the rest. A big part of the problem is that the traditional lift-and-shift, larbour arbitrage BPO model is so engrained in many of these execs minds that they find it difficult to see (let alone run or manage) a different type of BPO operation - one based around expertise. Senior management know what they want, but are finding the traditional BPO partners cannot deliver to their expectations thus tend to retain services inhouse to ensure they can control outcomes closer. Marketing outsourcing was exceptional in that the service delivered is, as you pointed out, highly expertise driven (not transactional or process driven). To have all these experts sitting in your office all year round is simply cost ineffective – similar to procurement services. Businesses need the capability to turn certain services on and off in line with business needs. But more over, theses services need to delivered with the highest level of expertise to drive true value. If you have a marketeer sitting in your office 365 days a year, they are more than likely going to be a generalist, covering multiple tasks, running errands, answering calls, negotiation with suppliers etc – their expertise and specialist knowledge recedes as they are burdened with more tasks and thus the specialist value delivered back to the business when it needs it the most is simply not there. This story is identical to procurement (and I bet HR, IT, Finance to some respects). The problem is choosing the right partner for your business – one who understands your business, your industry, your competitive landscape (both today, yesterday and tomorrow) and acts as a true business partner. Many BPOs simply look at making processes more efficient rather than making the entire service more effective and ultimately more value adding. It is ALL ABOUT MATURITY ! Potential customers of outsourced services should assess their needs an a scale of maturity which starts at Level 1 "Labor arbitrage" and reaches Level 5 "Business value sharing". The whole maturity concept includes human and cultural aspects too. Providers may also benefit from a prior assessment of the level of maturity of their potential future customers ! Phil, I have passed on to my colleagues the two "sham" articles as in my view, your repositioning doctrine is "spot on". I will endavour to influence repositioning of my firm's services to elevate ourselves from the masses. LOVE the premise of splitting labor vs. service plays... what I see missing in service teams within industry is the premise of'thinking like a business' -- that is, knowing what your "sell" (do) in a service organization and how it aids ("adds value") the larger corporate strategy. That value lever then helps drive the decisions re: how is the service delivered, from where, and by whom? Just like a business, they should also understand their cost to produce, the price customers are willing to pay, and be thinking ahead to your next product that will enable enterprise success - whether that is using technology to reduce cost per transaction or leveraging specialized knowledge across the enterprise to create better business results. My analogy is Cisco - my Linksys router bought at Best Buy has a totally different R&D, sales, and support model than their high-end custom network installations. So why should A/P services work just like Engineering Services? But hey - it's all GBS/outsourcing, right? just like network connections . My feeling is that most industry buyers focus on cheaper vs. better (which leads to value - including cheaper!) because the business world wants results NOW and the CEO/CFO/CIO have targets to reduce cost, not to enable the business. Cost is an easy thing to prove; better takes faith and time. And now we providers - no matter how hard we want to move to a business solutions offering - get pushed back to outsourcing solutions by uninformed, immature buyers of services.